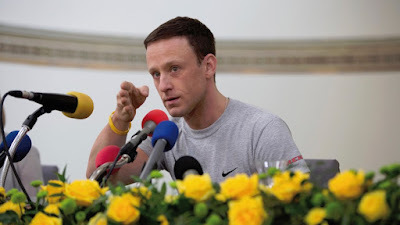 Stephen Frears’ new fictional retelling of the now sadly familiar Lance Armstrong story is NOT a great film, but it does contain a great performance. And if Ben Foster doesn’t win an Oscar for his turn as the disgraced seven times Tour de France cheat, then there’s a really outstanding movie out there that I have yet to see. Hugely informed by USADA’s investigation, Floyd Landis’ testimony and the heroic David Walsh’s investigative journalism, this film is not a straightforward biopic. We never meet Lance’s mum, or spend time with his wife or children. This movie is, to invert the book title, all about the bike, and all about the dope. We meet Lance as a young racer in the early nineties literally getting mud splashed in his face by dopers he will never beat unless he “gets with the programme” - and that’s the programme of micro-doping, EPO, testosterone and cortisone invented by the ever-proud and morally deficient Michele Ferrari. John Hodge’s script loses no time in taking us on a fast paced tour through Lance’s early failure, cancer, that fateful and contested meeting with Andrieus, and onto his Tour success. We’re an hour in and he’s the ultimate sports hero. But we see vanity cut him down as much as it drove on - both in returning to the Tour and in cutting Floyd Landis lose. Because as much as the trailers might depict this as a battle between a megalomaniacal cheat and a crusading sports writer, the film is actually a contest between Floyd Landis and his conscience. The Andrieus barely get any screen time at all (maybe because of ongoing legal issues? ), and insofar as David Walsh gets a heroic moment of self-justification it’s Floyd’s testimony that does the work. We then get the iconic interview with Oprah and it’s done. There’s not even that much race footage. I’m no cycling enthusiast but I do love sport, and like many people I’ve been transfixed by the story of Lance Armstrong. Not just a story about a driven cheat but of a wider ecosystem that makes him think he can get away with it - indeed colludes and enables him to do so. For me, that’s even more fascinating that the psychopathology of the man in the spotlight. I’m also fascinated with all the sports brands and sponsors who, like the the average sportsfan, just couldn’t bear to believe that the fairytale was just that. There’s a telling line half way through this film when Lance tells an adoring fan who turns out to be his future wife that sometimes you’ve just got to tell them what they want to hear. Let’s get down to the good and bad of this film. In a sense I am disappointed by Stephen Frears rather simple, if fast-paced, structure. The film can at times feel like a straightforward re-enactment of all the famous interviews in Lance’s career - a join-the-dots narrative if you will. I also feel we should’ve got something more of what made Lance the man he was, able to have the conviction to do what he did. I wanted as much context for Lance as we got for Floyd, and if we didn’t get that, is Frears making a point about a moral and emotional vacuum at the core? I also wanted to see more complicity - to really spend time with Lee Pace’s sports agent. What’s great about this film is everything to do with Ben Foster. It’s not that he’s a dead ringer for Lance. But there’s a self-confidence, a mocking laughter, a certain narrowing of the eyes as he almost tries to psych you into believing the narrative he’s fashioned. For those of us who’ve seen those interviews and deposition tapes again and again, Foster just gets it. He portrays the self-belief, the bullying, and yes, even the man who does want to help cancer patients even as he uses his charity as a veil. There’s a scene near the end of the film where Lance has been handed a lifetime ban by USADA and he goes from bravado to outrage to crumpled disbelief to determination not to show how upset he is. That’s Ben Foster’s Oscar clip right there. THE PROGRAM has a running time of 104 minutes. The movie played Toronto and was released earlier this year in France, Iceland and Germany. It goes on release in the UK on October 16th, in Greece on November 5th, in New Zealand on November 26th, in Lithuania and Sweden on December 4th.